There is no healing system more powerful than that which employs Nature’s primordial substances; materials so pure and close to nature that they yield benefits without the typical side effects of most drugs. The secret to safe and effective medicine is found in using medicinal substances that do not have side effects in reasonable doses. This is the very meaning of safe, something that will not harm or hurt you. “My daughter was stricken with this horrible affliction. Cipro sensitivity causes long term (multiple years to life) chronic pain, weakness and tendon weakness leading to tendon breakage and many other horrible effects, some physical and some mental. This is something that everyone needs to know about. We have been destroyed by cipro. I don't think there is much anyone can do, except to give her magnesium, which is somewhat of an antidote. I am very worried but I haven't lost hope, but I am being realistic. Some of the tendon damage is necrotic and permanent. However, we have studies with rattlesnake venom that produce necrosis on animals and simply applying magnesium (chloride) and zinc (gluconate) topically, the necrosis vanishes.” Ten days later I received this email from George. There is a power and a force in magnesium chloride that cannot be equaled anywhere else in the world of medicine. There is no substitute for magnesium in human physiology; nothing comes even close to it in terms of its effect on overall cell physiology. It goes against a strong gale wind of medical science to ignore magnesium chloride used transdermally in the treatment of any chronic or acute disorder.The Heavy Guns of MagnesiumIn the emergency room medicines have to be safe while delivering an instant life saving burst of healing power. Magnesium obviously is the heavy weight champion in this regard though there is a terrible ignorance about this fact. It’s like medical hypnosis; doctors cannot see what is in front of their very eyes. They have a medical super weapon that unfortunately no one can make much money off, so it’s not supported in the literature or in medical schools. Talking about the blinding light of conflict of interest, in the area of medicine it kills millions. In the area of magnesium medicine there is a mountain range of scientists who have for decade’s penetrated magnesium’s secrets. There are four hundred references in my eBook “Transdermal Magnesium Therapy”, the majority linking to original medical research. Magnesium is life saving and that is power. It is as simple as that! 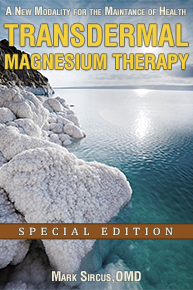 Magnesium has the power to reduce human suffering in a wide variety of clinical situations. Results of a 10-year study published in the August 28, 2008 issue of the New England Journal of Medicine found that magnesium sulfate administered to women delivering before 32 weeks of gestation reduced the risk of cerebral palsy by 50 percent. [ii] The Beneficial Effects of Antenatal Magnesium Sulfate (BEAM) trial was conducted in 18 centers in the U.S., including Northwestern Memorial, and is the first prenatal intervention ever found to reduce the instance of cerebral palsy related to premature birth. Magnesium sulfate is traditionally used in obstetrics to stop premature labor and prevent seizures in women with hypertension. Obviously if a medicine is safe and strong enough for emergency situations it is going to help us with chronic diseases. The field of cardiology has to deal with heart disease as both an acute and chronic disorder and that is just one more reason they should fall heads of heels in love with magnesium chloride. 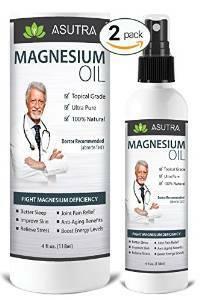 Magnesium is truly astounding in terms of safety, low cost and proven effectiveness. Put in the clearest terms possible, our suggestion from the first day for cancer patients is to almost drown oneself in transdermally applied magnesium chloride. George Eby used on his slight daughter approximately one ounce applied to the skin a day. Magnesium is life saving, it is as simple as that. Who Can Benefit from Magnesium Therapy? Arthritis, Insomnia, Fatigue, Body tension, Headaches, Heart-Disorders, Low Energy, High Blood Pressure, PMS, Backaches, Constipation, Kidney Stones, Osteoporosis, Irregular-Heartbeat, Anxiety, Muscle Cramps or Spasms, Irritability, Confusion, Poor digestion, Rapid heartbeat, Seizures, Can be synonymous with diabetes, Cause cardiac arrhythmia, Hypertension, Asthma, Chronic fatigue, Chronic pain syndrome, Formation of kidney stones. The serum magnesium concentrations are compared between the three clinical classification categories established in 1993 by the Centers for Disease Control (CDC) (infection) by the human immunodeficiency virus) in adults, and its relation with the CD4 lymphocyte count, albumin, and pre-albumin. The serum magnesium concentration is part of the broad analytical screening and it is determined by atomic absorption spectroscopy. The data obtained were analyzed by the statistical program SPSS. The comparisons of the serum magnesium concentrations between the three clinical categories of the CDC were evaluated by an analysis of variance (ANOVA test). Afterwards, and using a regression analysis, the relations between the different variables were evaluated. 35 patients affected by HIV-AIDS were studied, 22 belonging to category A, 3 to category B, and 10 to category C, 29.4% of the patients studied presented hypomagnesemia, with an average serum magnesium level of 17.6 +/- 10.3 mg/l. There is a quadratic relation between the serum magnesium level and the number of CD4 lymphocytes in HIV-AIDS patients studied. 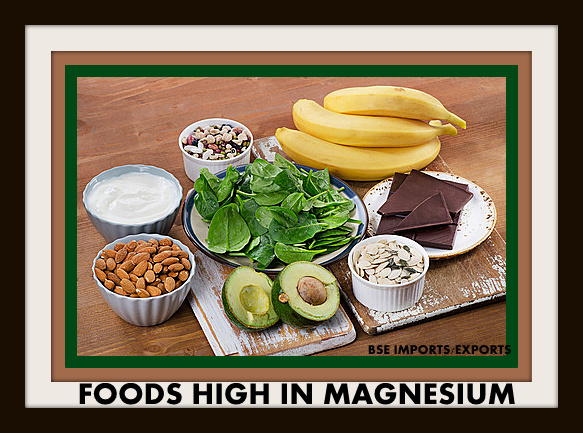 A larger number of cases would allow us to conclude whether hypomagnesemia is a factor belonging to the disease, as well showing the possible differences in the magnesium state between the three diagnostic groups studied. Future studies will be necessary to clarify the role of magnesium in the clinical progression of patients infected by HIV. 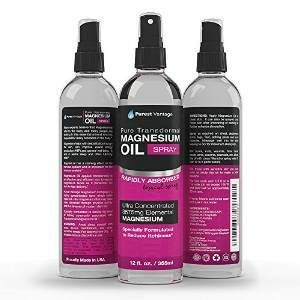 There are many brands of Magnesium Oil on the market. I tried one brand from iherb from Life Flo Health that I asked for a refund for. I now see Dr. Sircus says to dilute the oil if it causes skin irritation. This brand caused water retention with me and I have a knee injury. I gave the oil away. I also saw one woman who made her own oil using the Magnesium Flakes. She used half water and half flakes. Dr Sircus says "I recommend the use of magnesium chloride over any other form. 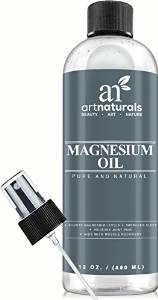 I also recommend to use magnesium oil and apply it transdermally to skin in massage or baths as opposed to taking oral tablet which take too long and have to go through the digestive tract first where many problems can affect absorption.If it irritates your skin at first, dilute it half and half with spring water till you get more used to it. You can also use it in baths, but the bath flakes are more economical for this.....and you can alternate the baths with the body applications.If you can get someone to give you a massage with magnesium oil this is a wonderful way to obtain even more benefits." of elemental magnesium. [iv] An ounce would contain just over 3,300 mg.
A sane rule of thumb for magnesium supplementation (not for therapeutic effect) is approximately 6-8 mg/kg (3-4 mg per pound) of body weight per day. That translates into a total dietary magnesium intake of 600 to 900 mg per day for a 200-lb man which is already way above the RDA, about double. With children some researchers indicate that 10 mg/kg/day are appropriate because of their low body weight and increased requirements for growth. Athletes also need more depending on their stress and training levels and we can always adjust upwards when under great emotional stress or when seriously ill.
Testimony - I am astounded at what I have learned from this book.. Please get these books, if you care about your health. Webmaster purchased this book also and wow so much information. There are 323 pages on the ebook and was so amazed with reading the first few pages, that I longed for more. The best money I ever spent. Dramatic relief for Sore Joints, Muscle Aches, Arthritis, Chronic Pain, Fibromyalgia, Migraine Headaches, Joint Inflammation, Muscle Aches, or any form of persistent pain. ­Premium Magnesium Supplement ideal aid in the reduction of stress, anxiety and the relief of symptoms associated with Chronic Fatigue Syndrome. ­Ideal sleep aid for those suffering from Insomnia and sleep deprivation associated with chronic pain. NATURAL & ORGANIC INGREDIENTS: Pure Magnesium Chloride sourced from the ancient Zechstein Sea in the Netherlands. Our magnesium oil is sourced from the ancient Zechstein Seabed - rated as the purest in the world. You can dilute it yourself easily if needed but the fact it's 100% pure - nothing added or taken away.